Home sharing sites such as Airbnb, HomeAway, Flipkey, and others have exploded onto the scene in the last few years. Airbnb is by far the best known and most used by travelers on their personal vacations. According to their own data, Airbnb has approximately 4.85 million global active listings representing 191+ total countries. In the United States alone, Airbnb self-reports approximately 31 Million Guest Arrivals, with over 150 countries represented, and stays lasting typically 43 Nights. With this level of popularity, it is not surprising that Airbnb is making long-term plans in the business travel market, and in particular, business travel management. With the launch and growth of Airbnb for Work (originally known as Airbnb for Business) a few years ago, Airbnb has been taking steps to gain traction with business travelers and their companies that are sending them. In fact, there has been a growing trend of businesses allowing their employees to book their own lodgings though Airbnb. In addition, Airbnb has recently been beefing up their dedicated business travel platform; David Holyoke, Global Head of Airbnb for Work, said in a recent interview that his division has seen an adoption rate of “300%”. Even with all of these changes, Airbnb, and other home sharing sites like it, still face a myriad of issues, including increasing oversight and regulation by cities, states, and countries, such as Ireland. And of course, there have been stories in the news of horrible hosts, unsafe locations, illegal activity taking place within the home, and so many more “Airbnb Horror stories”. A simple google search of this phrase can easily bring up more than 30,000 results. This poses a serious issue for HR Managers, Travel Managers, and companies in general. By letting their employees book thorough Airbnb, is the company opening itself up to safety and liability issues? There is research indicating that this might be the case. In November 2017, one of the most comprehensive reports of Airbnb Safety was released by Asher Fergusson, S.R. Ahlqvist, and Erin Smith. Fergusson is a well-known Travel Blogger, author of the Asher & Lyric blog, and has had stories featured in USA Today, The Boston Globe, Business Insider, and others. He spends most of his time traveling the world with his wife and two children. While he is not specifically focused on “business travel”, Fergusson does a great job outlining many of issues that Airbnb has had and continues to have with their platform and guest experience. 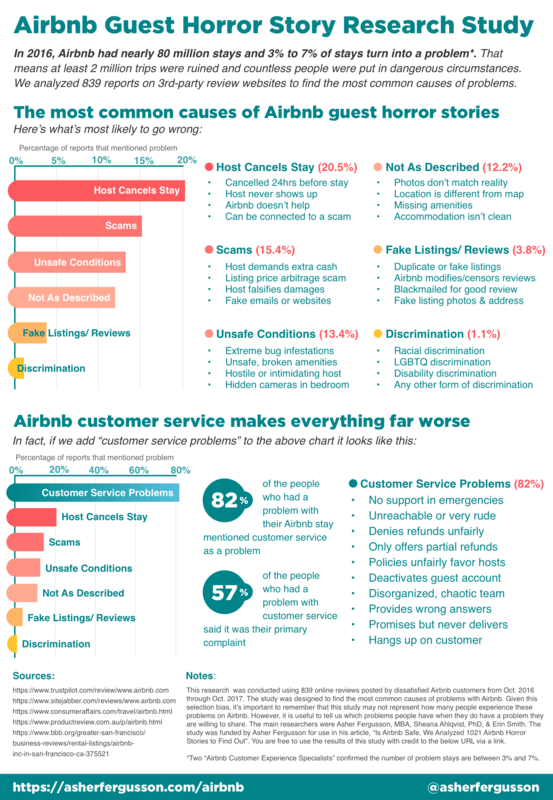 The report, aptly titled “Is Airbnb safe for guests? What causes an Airbnb stay to turn into a horror story?”, examines approximately 1000 “Airbnb horror stories” from 2016 through 2017 and uncovered some disturbing trends that all HR Managers and Travel Managers should be aware of. While Fergusson and his team were unable to uncover the exact number of problematic Airbnb stays, they were able to confirm from two individual Airbnb Consumer Experience Specialists that the “number of problem Airbnb stays is between 3% and 7%”. Based upon the total number of arrivals/stays (31 Million) that Airbnb reports, this would indicate that problem Airbnb trips could be anywhere between 930,000 and 2,170,000. This number should be quite alarming to anyone who uses the platform as well as the businesses who are contemplating utilizing Airbnb for their business travel. Of these categories, while all are concerning, perhaps the most concerning for businesses are categories 1-4. Based upon Fergusson’s research, these four categories make up the majority of problematic Airbnb stays. These 4 categories are broken down further in the graphic below, which is also from Fergusson’s research. Keep checking back to read more or subscribe to our blog to receive the next post in your email. This is going to be an in depth and behind the scenes look at the costs and benefits of home share sites and corporate housing companies – stay tuned.